Comfortable heeled sandals just for you! When was the last time you felt comfortable in high heels? Do you love heels, but can’t bare the pain? What if I told you, you could find comfort in a 3 ½ inch heel, would you believe me? Lucky Feet Shoes recently added the Dansko Daniela high heel to their sandal collection and these beauties have the potential to turn you into a believer. 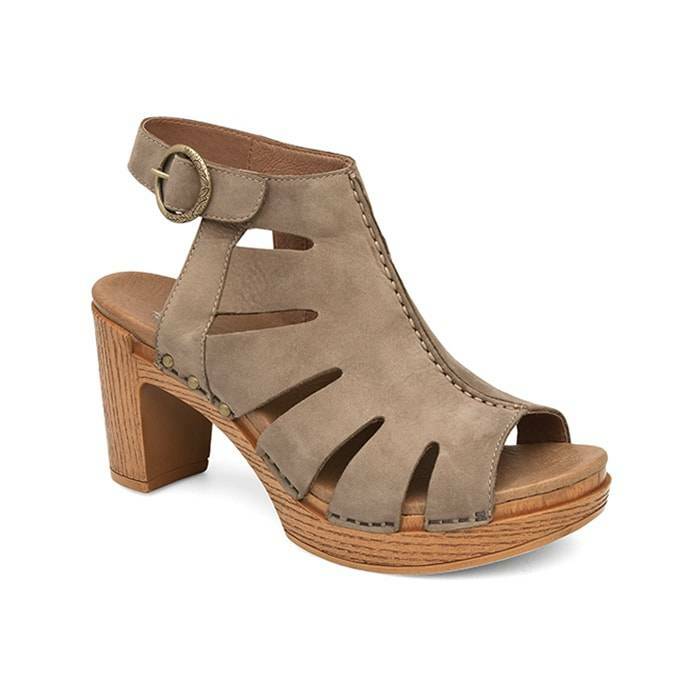 Find the most amazing comfortable heeled sandals in Dansko! The Daniela’s chunky block heel adds comfort and stability to keep you safe on your feet, unlike those pesky stiletto heels. Remember that one time when your stiletto heel got caught in a hole and you tried to pretend nothing happened? Don’t be embarrassed, it has happened to all of us at one time or another (it has happened to me more then I would like to admit). Guess what? With Daniela, you can prevent these embarrassing moments and possibly keep your ankles safe from unwanted sprains. Daniela is one of the most comfortable heeled sandals you will EVER come across. It is a perfect fusion of style and long-lasting comfort. The shoe’s footbed delivers unbelievable comfort as it molds to your arches and cradles your heels. Thanks to its extraordinary arch support and unbelievable cushioning; Daniela makes it possible to carry on your day in total comfort. Try on the Dansko Daniela and feel the comfort yourself. Not only will you experience incredible comfort but feel beautiful in them too. Wear them for a girls-night-out or date night, but be sure to be open for a compliment or two. This gorgeous t-strap sandal is a definite head turner and its modern stud accents are perfect attention grabbers. 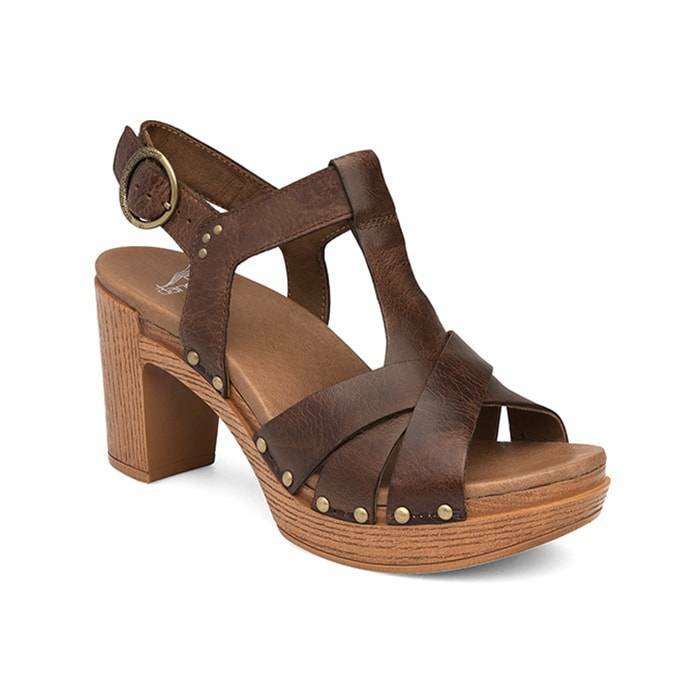 The adjustable buckled heel straps will certainly flatter your ankles just right. This is a lovely versatile sandal that will make you feel beautiful in every outfit. Try on the Dansko Daniela and experience the 3 ¼ inch comfort yourself. Visit us at any of your Lucky Feet Shoes stores, for a personalized shoe fitting. Click here to schedule a free foot analysis or click here to find a store near you. Schedule an appointment to get a personalized fitting and we will help you find some of the most comfortable sandals around. Come into any one of our stores, located in Anaheim Hills, Rancho Cucamonga, Riverside, San Dimas, Temecula, La Quinta and Palm Desert! Visit us today and try on a pair of Dansko shoes! At Lucky Feet Shoes, we carry many Dansko shoes: sandals, heels, wedges, flats, booties and boots; in any of our Southern California stores. If you are looking for Dansko footwear in Orange County, the Inland Empire, Los Angeles County, Temecula or Riverside; we have seven stores to serve you! Come and visit us today! If you are looking for comfortable heeled sandals in Anaheim, Anaheim Hills, Yorba Linda, Brea, Orange, Placentia, Costa Mesa, Santa Ana, Fullerton, Irvine, Villa Park or Tustin; visit our store in Anaheim Hills. If you are looking for comfortable heeled sandals in San Dimas, Glendora, Pomona, Covina, West Covina, La Verne, Azusa, Diamond Bar or Claremont; visit our store in San Dimas. If you are looking for comfortable heeled sandals in Rancho Cucamonga, Ontario, Upland, Fontana, Rialto, Chino, Chino Hills, Mira Loma, Eastvale, Colton or San Bernardino; visit our store in Rancho Cucamonga. If you are looking for comfortable heeled sandals in Riverside, Moreno Valley, Corona, Rubidoux, Loma Linda, Grand Terrace, Redlands or Norco; visit our store in Riverside. If you are looking for comfortable heeled sandals in Indio, Coachella, Thermal, Vista Santa Rosa, Valerie; visit our store in La Quinta. If you are looking for comfortable heeled sandals in Cathedral City, Thousand Palms, Palm Desert, Palm Springs, Desert Springs, Rancho Mirage or Bermuda Dunes; visit our store in Palm Desert.